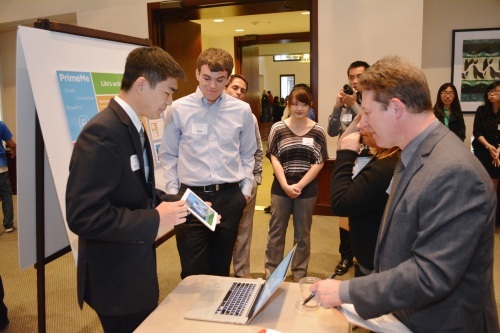 The awards ceremony of the second annual Autism AppJam sprawled across two rooms at the UC Irvine Beckman Center on April 25, flooding the team demo tables with a sea of gadgets — smartphones, Google Glass, Xbox Kinect, and more. Just two weeks before, the 155 students from UC Irvine and Chapman University scrambled to form teams and formulate ideas for applications that could benefit the autism community. At the awards ceremony, the 31 teams demonstrated the results of their tireless work to a group of judges from industry, local schools and autism organizations — as well as guest judges with autism. Presented by the Center for Autism & Neurodevelopmental Disorders of Southern California and directed by ICS associate professor Gillian Hayes, Autism AppJam was held during April in recognition of Autism Awareness Month. “People who know nothing about autism get involved because maybe they are good designers or developers, and in the process they learn about autism. That is where we make the biggest impact,” Hayes explained. According to U.S. Centers for Disease Control and Prevention (CDC) estimates, 1 in 68 children have autism spectrum disorder (ASD) — a number that has increased dramatically in recent years. ASD ranges in severity, and can cause significant social, communication and behavioral challenges; people with ASD may communicate, interact, behave and learn in ways that differ from most people. Hayes said apps have the potential to make a positive impact on the lives of the autism community in myriad ways. These include: therapeutic systems for individuals with ASD; support technologies for caregivers in various capacities; and technologies for assisting in everyday activities individuals with ASD may struggle with. Apps were judged on the criteria of relevance to autism, uniqueness, creativity, presentation, and the design process documented by each team’s social media presence. Hayes favored apps that prioritized functionality as the most beneficial to the autism community. “I would rather see something with a lot fewer bells and whistles that really works,” she said. A continuous loop of student-made video app demonstrations played in the background while the judges made their rounds at the demonstrations and awards event. Student coordinator and informatics major Van Erick Custodio timed each stop of the judging panel, signaling the judges to move on to the next team with the musical ding of a xylophone. While most students built apps for smartphones, tablets and computers, some designed apps to be compatible with specialized platforms like Google Glass, Xbox Kinect and even a sensor-outfitted teddy bear. Software engineering student Erick Kusnadi explained the reasoning behind his team’s use of a stuffed toy. “One of the most important things is early detection of autism, because the quantity and quality of therapy available, and the quality of life, is much better. We thought, ‘What if there was a toy that could detect autism in children when they play with it?’ There is research that has shown … that someone on the spectrum plays with toys differently,” he said. Ultimately, the top three prizes went to teams composed entirely of UC Irvine students. Team APPetizer took the grand prize of $3,000 for their app “SayCheese,” designed to aid communication between autistic children and their parents through picture-oriented story logging. Team APPetizer plans to donate their winnings to charity. “We decided beforehand that if we won, we were going to donate the money because it was the right thing to do,” said team member and computer science student Jesse Alas. Click here for more photos of Autism AppJam.